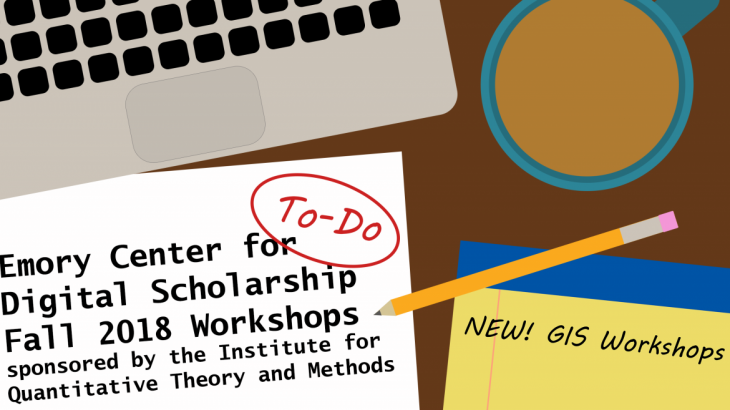 Emory Center for Digital Scholarship (ECDS) is partnering with the Institute for Quantitative Theory and Methods (QTM) at Emory College of Arts and Sciences to provide workshops for coding, publishing, and data visualizations this fall. September and October will feature our Coding in R series, taking participants from the basics of coding in R through more advance topics to a workshop focused on text mining in R. The second half of the semester will showcase workshops on working and publishing in Git and GitHub and a visualizations workshop in Tableau. New this semester will be our GIS workshops that will introduce users to Esri’s ArcGIS Desktop and the new ArcGIS Pro software, as well as the free and open-source alternative, QGIS. We’ll cover common tasks in working with spatial data and creating maps. There will also be a workshop devoted to the popular question of geocoding, or how to turn street addresses into latitude/longitude coordinates. To increase everyone’s chances to attend, each of these workshops will be offered twice – once in September and once in October. We hope – after evaluation and feedback from this inaugural semester – to continue these regular and more frequent GIS workshop offerings throughout the academic year. If you have any questions about our workshops, send us an email! events ArcGIS, GIS, GitHub, QGIS, R, Tableau, workshops. permalink.